I often get asked in the comments on a post here or on my Google+ account about the details of my map-making. First of all I should aim anyone interested in my mapping styles and techniques to the appropriate graphical tutorials that I posted last year. But now, let’s talk about the tools involved in my cartography. Until this year I used a 0.7mm Gel Pen that I bought from Staples / Business Depot (the Zebra Sarasa) for most of my maps. There’s also a bunch that I drew in pencil using a classic HB / #2 pencil that I would hand-sharpen instead of using a pencil sharpener (most of the pencil-drawn maps have been released under the “Lost Maps” tag). I would draw on just about anything, but the vast majority of my 2012-2013 maps were drawn in little 4×6 books I would buy at the Dollar Store – I had to keep an eye out for them because most books at the Dollar Store have lines, and these were pretty sweet little plain-paper books. One of them is completely filled with maps and is hidden away in storage somewhere. Two others are each about 1/4 to 1/2 full now, but I don’t pull them out very often. But really, I draw my maps on everything. I have maps on the insides of novel covers, on receipts, post-it notes, graph paper, and random bits of paper that cross my path. Things changed in 2014 thanks to my Patreon Campaign. 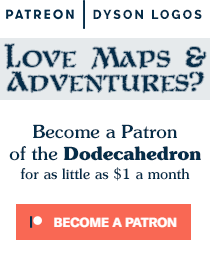 People who like the free maps and who feel like they should / can contribute financially to the continued production of said act as patrons of my work – the maps remain free, but some fans help pay for the continued production of these maps for everyone through Patreon. It’s been a total game-changer for me. Now I use Sakura Micron pens for my work. Typically I use the 03 for walls, the 01 for crosshatching and the 005 for small details. If I’m working on super-fine graph paper or drawing a city then I switch to the 01 for for most stuff and the 005 for crosshatching and details. I do most of my drawing now on Canson graph paper pads. Canson uses very light blue lines making it easier to lose the gridding in scanning (they were designed so the blue would wash out completely when photocopied). When I’m done a map, I slap it on the scanner I have. It’s just the built-in scanner from a 4-in-1 printer. Back when I was really really poor I was using a printer that I got for free on Craigslist – the printer heads were fucked, but the scanner still worked. I scan it into Photoshop (used to use the Gimp) as greyscale at 600 dpi. Then I increase the brightness by +20, and the contrast by +40 to +60. This removes most marks except some pencil marks, and definitely kills the grid in all but the darkest graph papers. I go around and try to white out any remaining blobs, blots, dots and dust on the scan. Then I use Photoshop’s “Stylize -> Diffuse -> Anisotropic” filter to clean up the edges. Then I reduce the dpi down to 300 to clean up any artifacts from the scan and it also reduces how unnaturally smooth the edges of each line are after the diffuse filter. This also brings the file size down enough that I can host it here. I also keep a backup on my google drive for every map I’ve scanned in the last three years, just in case. For some of my maps I also add a screen – like the dots in the water in the maps slice shown above. I have these screens saved as patterns that I overlay over specific areas in photoshop. I generally use dot screens for water and I have some tree screens I use for regional maps. But that’s all the technical stuff. The reality is that isn’t what makes my maps what they are. One of the things you’ll note with a majority of my maps is that they work into three dimensions as much as I can. This is something that I feel makes my maps stand out in the field. If there are two levels to something, and they don’t cross over each other TOO much, why not put them both on the same map? I make heavy use of stairs, ramps, ladders, cliffs, drops, and other methods of changing elevation in a map because discussing elevation is a quick way to stop the players from seeing it as just a 2D game board. The trick is to get their brains involved in visualizing stuff, and a bit of 3-dimensional thinking is a great method to make them think it through a bit. I also just draw whatever comes to mind. A lot of my maps started out as just an entrance to a dungeon, or a single room, and the map spread out organically from that point. Most of my maps are drawn straight in pen in a single draft. I generally only use pencil to rough out my maps when working on commissions or when dealing with surface structures that need to make use of 100% of their available space. Those scanning and cleanup instructions are very useful. Thanks! I’m a big fan of you maps and a would-be cartographer myself. And I like technical nitty-gritty. So thanks a lot for this post! Good, ’cause I’ve been doodling Dyson-esque maps at work aaaallllll week, and this will certainly help me to do that. And to feel less like I’m totally ripping you off. Definitely good info herein. Thanks from one of your patrons! Not that it’s hard to find Canson products but the link in the article is bad. Thanks for the update – seems they have changed their site once again! Thanks so much for this information! I wasn’t getting the results I wanted from an ordinary fine point pen, so I just picked up a couple of micron pens on sale at the craft store. Much better! Any idea what the equivalent of the Stylize -> Diffuse -> Anisotropic filter is in GIMP?